What if you need to move G-Lock EasyMail from one computer to another or re-install your system? You want lose any data in G-Lock EasyMail because the program provides you with a quick and easy way to backup and restore your workplace [address book, accounts, settings, signatures, and email messages]. Just save your workplace backup and keep it in a safe place. 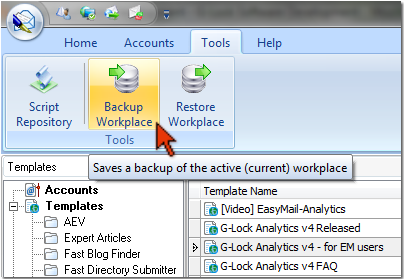 When you re-install G-Lock EasyMail, restore the workplace from backup …without any data loss.